For the premiere of Scandal, it only made sense for me to host a "dinner party" for my girls before the show. I hosted it at my fiance's home, even though he didn't have much for me to work with. 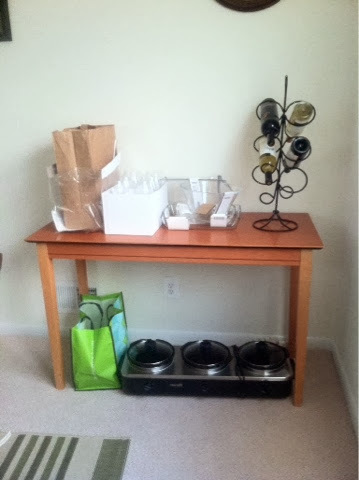 I went to storage (aka, grandma's basement) and picked up a table that I scored at moving sale for a store in the mall. I also picked up the crockpot trio from my parents (that I'm keeping until Thanksgiving) to cook the sides and keep them warm. I also stopped by Ikea to pick up some stemware, glass bowls and serving dishes. I had a few bottles of wine on hand, so I threw them in our wine holder. Check out the ready-made section at Costco/Sam's Club. Throw the food in the crockpot before work. Three dishes could have been cooking all day, cutting dinner time down.